For more information on any of our 2018 Performers, please click HERE. Santa & Mrs Claus will be onsite from Noon until 5pm (he’s got important work to do!) - photos with a donation to Epilepsy Toronto. Festive Cheer Carolers will be adding their beautiful harmonies to the fair from 12:30 - 3:30. The UTSC Glee Club will be singing for the season at 1:00, around the Fireside Lounge. 2:00 - 5:00 Bella Magic strolls - take photos or just enjoy her beautiful contact juggling. From 2:30 to 5:30 Silver Elvis will be rockin’ around the Christmas tree. The Fair will be closed by 6:00 pm. Santa & Mrs Claus will be onsite from Noon until 8pm - photos with a donation to Epilepsy Toronto. Bex in Motion will be warming things up with some firey Hula hooping between 2:00 and 5:00. Between 3:30 - 6:30, Stilt Guy will be hovering above, so look up! Ice Girl will Freeze you in disbelief and awe with her hula hoop, juggling and LED skills, between 6:00 - 9:00. With lots of holiday cheer, the Snapback Santas bring you the spirit of the holidays through upbeat, joyful renditions of the tunes we all know and love, between 6:00 and 9:00pm. Look up, way up and catch Stilt Guys between 5:00 - 8:00. Watch for Silver Elvis, rockin’ around the Chistmas tree, between 5pm - 8pm. 3:00 - 6:00 Bella Magic strolls - take photos or just enjoy her beautiful contact juggling. Catch the Mad Magic of Max T. Oz after 3:00. Watch the Candy Cane Man as he juggles all things red and white, between 6:00 - 9:00. Watch for Bex in Motion and her firey hula-hoops, performing between 2:00 - 5:00. Jingle bells will rock, 5:00 - 8:00 as Silver Elvis is on the Square. Celebrate with some loud, lively, european music with Balkan Society Brass between 6pm and 9pm. Candy Apple Jazz Band will put a swing in your step and help keep things warm in the square between 6:00 - 9:00. Watch for Bella Magic, strolling the fair, from 5pm - 8pm. Max T. Oz will be on site at 3:30, performing close up magic and amazing those who catch him. Watch for the Candy Cane Man, juggling more than just candy canes, between 6:00 - 9:00. Randolph Glee Choir wil be bringing their high energy performance to the fair at 3:30 and again at 4:30. Between 3:30 - 6:30, Stilt Guy will be handing out ‘high’ fives, so look up! Watch for Jenny Juptier the living Toy Soldier, on site between 5:00 and 8:00 pm. NEW!!! Santa will be on the Square from Noon until around 8:00 pm. Come enjoy your P.A. Day with us! The Dirty Dishes will be dishin’ up some good ole country-bluegrass-gospel by the fire between 6pm and 9pm. Holiday mischief and mayhem abound when Slava Polunin’s disarming troupe of clowns blow into Holiday Fair in the Square on December 5 at 5pm. These globally beloved, Olivier Award-winning clowns will add a dash of whimsy to the evening with cheeky impromptu snowstorms, foolish fun with Santa and Mrs. Claus, and impish antics with the Festive Cheer Carolers. 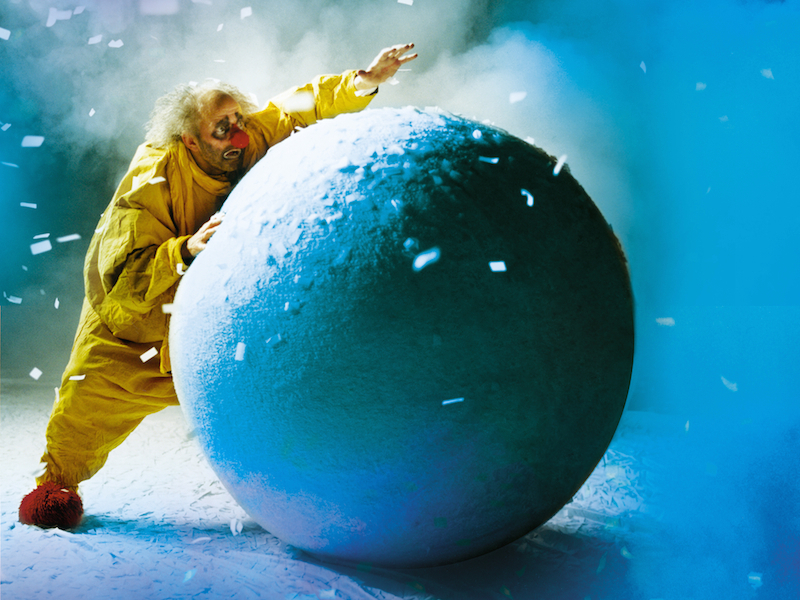 Catch the clowns in performance in Slava’s Snowshow, running December 7-16, 2018 at Bluma Appel Theatre at St. Lawerence Centre for the Arts. Tickets from $59 at Show One Productions. 2:00 pm Desna School Of Ukrainian Dance will perform (near the Polar Point Lounge). Silver Elvis will be rockin’ the jingle bells between 3:30 and 6:30 pm. Candy Cane Man will be keeping things up in the air between 6:00 - 9:00. Watch for FireGuy lighting up the Square, between 3:00 - 6:00pm. Silver Elvis will be rockin’ the jingle bells between 5:30 - 8:30.